Hey kids, know what time it is? 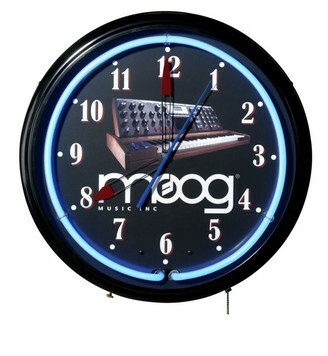 It’s Moog time — and that means it’s time to put tacky, geeky wall clocks with glowing blue neon on your wall. Truly kitschy enough that I might be willing to part with US$219. Check out the Moogwear section of the site for still more Moog-logo products, including the great I’m an Idiot t-shirt and must-have MiniMug. Remember, coffee is the real official product of CDM. Breakfast of champions.